San Pedro del Pinatar is a small town and municipality in the autonomous community and province of Murcia, southeastern Spain. Kick off your visit on the 19th (Mon): enjoy the sand and surf at Las Salinas de Torrevieja, kick back and relax at Guardamar Moncayo Beach, then take in the waterfront at Dique de Levante Breakwater, and finally explore the activities along Las Charcas Mud Baths. On the 20th (Tue), you'll have a packed day of sightseeing: stroll through Playa de la Zenia, test your problem-solving skills at popular escape rooms, and then enjoy the sand and surf at La Mata Beach. To find where to stay, reviews, maps, and other tourist information, read our San Pedro del Pinatar holiday planner . London, UK to San Pedro del Pinatar is an approximately 13-hour flight. You can also drive. Traveling from London to San Pedro del Pinatar, you'll lose 1 hour due to the time zone difference. In August, San Pedro del Pinatar is somewhat warmer than London - with highs of 34°C and lows of 26°C. Wrap up your sightseeing on the 20th (Tue) to allow time to travel to Orihuela. Orihuela is a city and municipality located at the feet of the Sierra de Orihuela mountains in the province of Alicante, Spain. Relax by the water at Playa El Rebollo and Playa El Moncoyo. Step out of the city life by going to La Mata Beach and Las Salinas de Torrevieja. Get out of town with these interesting Orihuela side-trips: Playa El Campo (in Guardamar del Segura), Jardín Huerto del Cura (in Elche) and Scuba & Snorkeling (in Santa Pola). It doesn't end there: stroll through Playa Barranco Rubio. For more things to do, photos, reviews, and tourist information, go to the Orihuela road trip website . Drive from San Pedro del Pinatar to Orihuela in an hour. While traveling from San Pedro del Pinatar, expect a bit warmer days and about the same nights in Orihuela, ranging from highs of 39°C to lows of 24°C. Finish your sightseeing early on the 23rd (Fri) to allow enough time to drive to Granada. Your cultural itinerary includes sights like Albayzin and Mirador de San Nicolas. Your itinerary includes some good beach time at Burriana Beach and Playa de la Cala el Canuelo. Explore the numerous day-trip ideas around Granada: Nerja (Playa del Molino de Papel, Fundación Cueva de Nerja, & more) and Malaga (Malaga Cathedral & Alcazaba). Next up on the itinerary: take in nature's colorful creations at Generalife, take in the spiritual surroundings of Monasterio Cartuja, contemplate the long history of Plaza de los Aljibes, and step into the grandiose world of Alhambra. 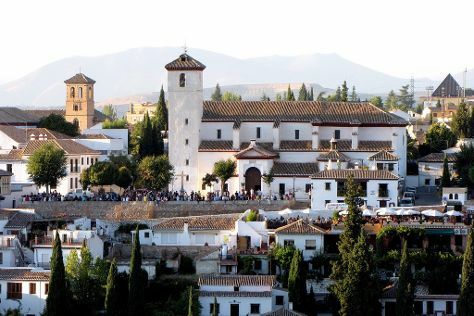 Take the guesswork out of planning a Granada vacation by using our trip itinerary maker. You can drive from Orihuela to Granada in 3.5 hours. Other options are to do a combination of train and bus; or do a combination of train and flight. In August in Granada, expect temperatures between 39°C during the day and 22°C at night. Finish up your sightseeing early on the 28th (Wed) so you can travel back home.